It is clear we cannot do the steps alone. We need to share the guidance we receive during our "quiet time" (Step Eleven) with another person. But, how do we decide who that person is to be? The person must inspire trust and be able to keep confidence. Everything that is shared between the two of you must be kept strictly confidential and not disclose to any party. He or she must be willing to work with you outside the meetings, either in person or over the telephone. The sharing partner must be willing to practice two-way prayer on a daily basis, and share guidance with you regularly. The sharing partner is essential, because as John Batterson writes in the How to listen to God pamphlet, "More light comes in through two windows than one". We need your help. 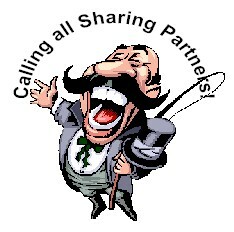 We are receiving more requests for sharing partners than we can handle. If you'd like to be of service someone who is just starting out on the spiritual journey of two-way prayer, please add your name to the sharing partner list. You just might help change a life or two. Email webmaster@aabacktobasics.org and we'll add you to our list of sharing partners and make your email available to those who need someone to talk to.